Ever hear of the Great Boston Molasses Massacre of 1919? On the Internet, it is regaled with “urban legend” status, but it did indeed happen. The New York Times has an old archived story of the event. The story is almost impossible to believe. 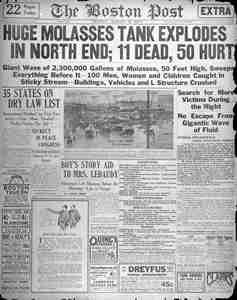 On January 15, 1919, a torrid wave of molasses swept a portion of Boston, Massachusetts, killing dozens of Bostonians in the northwestern sector of downtown. It didn’t happen without warning, however: the story actually begins in 1915, with the hasty construction of a tank 58 feet high and 90 feet in diameter by United States Industrial Alcohol Company. The tank was used as a holding tank for 2.5 million gallons of molasses. Molasses was used to make rum, and also used to make industrial alcohol for ammunition. Demand was high, and there’s money to be made. We all know what’s going to happen. There’s an archived duplicate of the story from Yankee magazine, which tells of the tragedy in a pre-National Enquirer/ambulance-chaser style. There were early reports of leaks showing up around the new tank. Of course these early warnings were disregarded. Actually, not only were they disregarded, they were hidden. As soon as the company caught wind of complaints of leaks, they painted the tank brown to hide the leaks. No one really knows what exactly caused the tank to burst that warm January day. Some say the sudden and severe temperature change from below zero the day before to near 40 degrees on January 15 made the molasses batch unstable. Others say the new shipment addition of a cool batch of molasses to the warm molasses already in the tank caused a fermentation process and the explosion. The ground started to quake, and the tank’s bolts popped out. Suddenly the tank ruptured. Huge sheets of metal flew down the street into buildings. A fountain of gooey molasses spurt up 30 feet high, rolled down the streets in waves, and buried everything and everyone in its path. Imagine a wave of boiling-hot molasses blurping its way through houses’ windows up the the chandeliers. Ever see “The Blob”? Witnesses stated that as it collapsed, there was a loud rumbling sound like a machine gun as the rivets shot out of the tank, and that the ground shook as if a train were passing by. …The collapse unleashed an immense wave of molasses between 8 and 15 ft (2.5 to 4.5 m) high, moving at 35 mph (56 km/h), and exerting a pressure of 2 ton/ft² (200 kPa). The molasses wave was of sufficient force to break the girders of the adjacent Boston Elevated Railway’s Atlantic Avenue structure and lift a train off the tracks. Nearby, buildings were swept off their foundations and crushed. Several blocks were flooded to a depth of 2 to 3 feet (60 to 90 cm). A one-ton piece of steel from the vat flew into a trestle of elevated railroad tracks, causing the tracks to buckle. Two children collecting firewood and dripping molasses near the tank disappeared under the fast-spreading liquid. The force of the molasses ripped a firehouse from its foundation, sending the second floor crashing into the first and trapping a stonecutter and several firefighters underneath. One drowned. The property damage, including a leveled commercial warehouse yard, was easily more than $1 million. More than 20 people died and 150 were injured in a suffocating tragedy similar to that of Vesivius. Hours after the explosion, the company’s lawyers were on the scene, preparing their defense by falsely accusing negligent workers. Creeps. 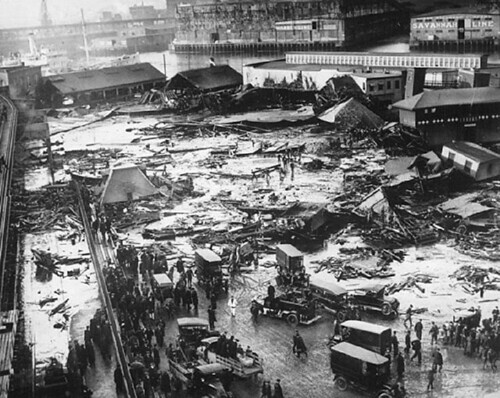 Firefighters (those who survived) tried to blast the molasses away with cold salt water. The molasses just frothed and foamed in angry waves. Cleanup took over a year. For decades, some said that on hot summers the pungent odor of molasses seeped up from the streets. A massive court case ensued. The United States Industrial Alcohol Company was found liable, and paid almost a million dollars to settle the claims. The city of Boston tightened their standards to require certified inspections and approvals. Several factors that occurred on that day and the previous days may have contributed to the disaster. The tank was poorly constructed and insufficiently tested. Due to fermentation occurring within the tank, carbon dioxide production may have raised the internal pressure. The rise in local temperatures that occurred over the previous day also would have assisted in building this pressure. Records show that the air temperature rose from 2°F to 41°F (from ?17°C to 5°C) over that period. The failure occurred from a manhole cover near the base of the tank, and it is possible that a fatigue crack there grew to the point of criticality. The hoop stress is greatest near the base of a filled cylindrical tank. The tank had only been filled to capacity eight times since it was built a few years previously, putting the walls under an intermittent, cyclical load. The sites of the molasses tank and the North End Paving Company have been turned into a recreational complex, officially named Langone Park, featuring a Little League ballfield, a playground, and bocce courts. Immediately to the east is the larger Puopolo Park, with additional recreational facilities. Image of the aftermath is at Wikipedia (see source list below). It’s truly one of those “believe it or not” stories. But it did actually happen– death by molasses. Yuk.